This small brown furry fruit looks similar to the outside of a Kiwifruit. The rich brown flesh has a soft melting texture and is very sweet with a taste like caramel or brown sugar. They are best eaten fresh by spooning the chilled flesh from the thin skin. The flesh is delicious mixed with orange juice and topped with cream. Selected cultivar from Philippines. Very sweet, medium size, elliptical with light brown skin. Sapodillas are highly prized in Asia with their sweet, brown-sugar cinnamon flavoured fruit that look like kiwi fruit. They have a slightly gritty texture like pears. Very sweet variety from Thailand, heavy cropper of small-medium sized fruit. 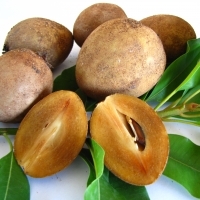 Sapodillas are highly prized in Asia with their sweet, brown-sugar cinnamon flavoured fruit. They have a slightly gritty texture like a pear, contains several shiny, black seeds. This variety originates from Singapore. 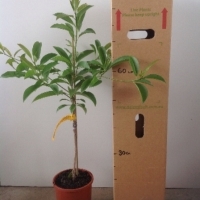 It has attractive red brown flesh when ripe with a mild flavour, the flesh is slightly gritty like a pear. 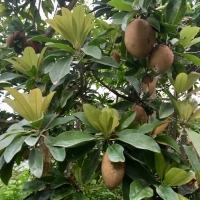 Fruits are oval and weigh 50-100 g. Sapodillas are highly prized in Asia with their sweet brown sugar cinnamon flavoured fruit that look like a kiwi fruit. Produces large fruits that average 300 grams. Ponderosa benefits from cross pollination and will have increased fruit set if the flowers are hand pollinated. A popular variety in the Philippines. Originating from Malaysia, the variety C55 is a medium sized fruit. Excellent backyard variety with a light brown skin and a delicious sweet flavour. 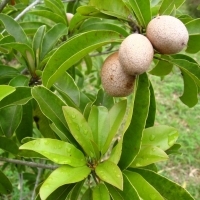 The size is similar to the Tropical sapodilla, averaging 60-70 grams. The flesh has a slightly gritty texture to it like a pear.